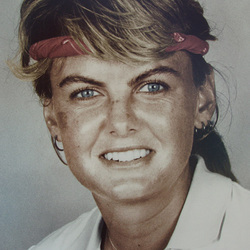 A three-time All-American, Ros Riach was one of the key figures in building the Hurricane women's tennis program into a national title contender during the mid-1980s. Riach compiled a four-year doubles record of 80-14 (.851 winning percentage) while playing mostly with partner Cathy Richmond. Her career singles record was an impressive 80-41 (.661) at UM. A four-year qualifier for the NCAA Championships, Riach was captain of Miami's 1985 team that finished second at the NCAA Championships and also was team captain of the 1986 squad that attained a No. 3 national ranking. Riach reached the doubles semifinals at the 1984 NCAA Championships and the quarterfinals in doubles at the NCAA tournaments in 1985 and 1986. In 1985, Riach was selected by the nation's collegiate tennis coaches to the All-Star All-American Team. Following her graduation, Riach returned to UM to serve as head women's tennis coach in 1989 and 1990. She is married to former Miami sports information director Rich Dalrymple, now the communications director for the Dallas Cowboys.